Following the removal of a large tree, the last part of the job is getting rid the stump. 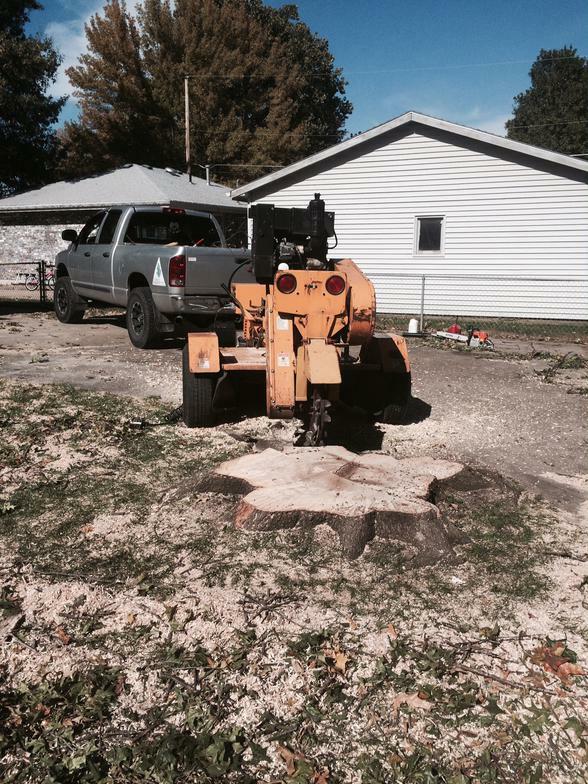 Most people are inclined to skip stump removal in order to save money, but we always recommend stump removal as the final step in the tree removal process. 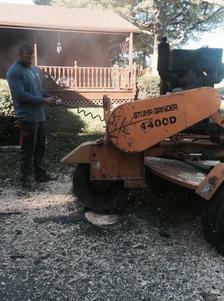 In order to plant something new in the area of the stump, complete stump removal is a necessity. Be sure to remove ALL of the stump and major roots if you want to plant another tree in the same vicinity. You will have to pay extra to have a stump completely ground out, since most stump removal bids only include removal of 4 to 6 inches of the stump below ground level. 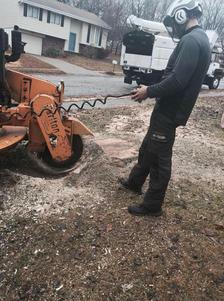 In some cases, where a large stump grinding machine doesn't have good access, you may have to leave a large portion of the underground stump, and plant away from the stump area. Planting trees and shrubs on top of old stumps (where there isn't adequate soil) is not recommended. Following the stump grinding process we will leave the mulch/grindings from the stump left in the hole and spread it evenly, if you would like the wood chips removed and the hole filled with soil it would be an additional cost.. Due to the near impossibility of removing all the old roots, many will remain in place, and you may eventually see mushrooms in the area where the tree once grew. Some types of old tree roots will also grow sprouts (Black Locust is a good example) -- these shoots should be removed on a regular basis to prevent any part of the tree from growing back.